In spite of the elbow being a very stable joint, elbow dislocation is still very common. Elbow dislocation occurs when the bones of the forearm (the radius and ulna) move out of place compared with the bone of the upper arm (the humerus). The elbow joint, formed where these 3 bones meet, becomes dislocated, or out of joint.Specific, serious injuries that may occur are fractures (breaking of the bones in the arm), injuries to the arteries in the arm (the vessels carrying blood to the hand), and injuries to the nerves that run through the elbow area, impairing movement and feeling in the arm and hand. How does a shoulder dislocation happen? A shoulder dislocation generally occurs after an injury such as a fall or a sports-related injury. About 95% of the time, when the shoulder dislocates, the top of the humerus is sitting in front of the shoulder blade–an anterior dislocation. In less than 5% of cases, the top of the humerus is behind the shoulder blade–a posterior dislocation. Posterior dislocations are unusual, and seen after injuries such as electrocution or after a seizure. 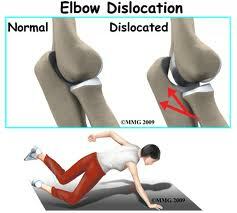 Elbow dislocation should be considered an emergency injury. The goal of immediate treatment of a dislocated elbow is to return the elbow to its normal alignment. The long- term goal is to restore function to the arm. Simple elbow dislocation are treated by keeping the elbow immobile in a splint or sling for two to three weeks, followed by early motion exercises.In a complex elbow dislocation, surgery may be necessary to restore bone alignment and repair ligaments. A person should go to the doctor’s office or hospital’s emergency department immediately if they are unable to move their elbow, have severe pain, cannot feel their hand, or have no pulse in the wrist.